Discovery Notes The environmental sample is dark-colored topsoil (3cm deep) taken from below a tree at a local park (elevation 16 ft.). The sample is approximately 20 ft. away from a large pond with ducks, turtles, and many geese around. 1/10 in. rain fell earlier in the morning. The temperature is at 91° F (33° C); at the time the sample was retrieved (noon), with an average humidity level at 89% for the day. 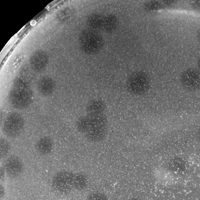 Plaque Notes This phage developes plaques that are approximately 5mm in diameter (area 19.6mm2). They are generally round, yet a some plaques have rigid edges. The plaques tend to form close together, rather than evenly spread on the top agar. Plaque diameter increases rapidly in the incubator. These cloudy plaques are 3-4mm in diameter after just 8 hrs at 37°C.